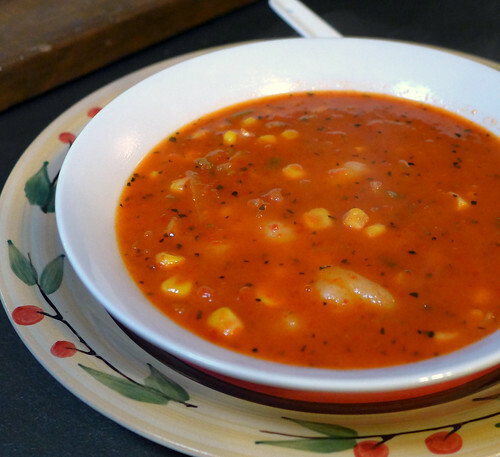 This might be my all-time favorite soup, you guys. AND I FREAKING LOVE SOUP! It’s like Candle Cafe’s roasted red pepper pasta sauce, but drinkable! So there are four roasted red peppers in this bad girl, along with corn (I didn’t have any peas, so I doubled up), leeks (or scallions, in my case), onions, veggie stock, and basil. The recipe includes instructions for making your own tofu dumplings by hand, but I took a shortcut by using premade potato gnocchi instead. It turned out aces. I’m not gonna lie; after my last red pepper fiasco, I was a little nervous about roasting my own, even if my method had served me well up until last week. But I seeded and sliced the peppers as usual, divided the slices between two glass baking pans, drizzled them with about a tablespoon of olive oil each, and then roasted at 425F for about 40 minutes. The skins? Peeled right off. Smooth as silk! Or whatever the vegan equivalent is. Satin, maybe? This entry was posted on Sunday, November 16th, 2014 at 1:50 pm. You can follow any responses to this entry through the RSS 2.0 feed. You can leave a response, or trackback from your own site. Oh, good to know! I’ll definitely be checking this one out. Sounds fabulous!